Alaska’s small Basic Income, “the Permanent Fund Dividend” (PFD), has recently come under greater political pressure than — perhaps — ever before. The PFD is a yearly dividend paid out of an investment portfolio, “the Alaska Permanent Fund” (APF), which is financed by accumulated savings from the state’s oil revenue. The fund has a principal of more than $50 billion, and it paid out a dividend of $1884 to each Alaskan in 2014. The dividend is fully funded by the APF. On its own it is financially sound. Barring a major catastrophe, as long as politicians leave the APF alone, it can continue to fund the dividend long after we are all dead. Politicians will leave the APF alone, or so most Alaskans thought until recently. The PFD has been so popular that it was known as the “third rail of Alaskan politics,” meaning that any politician who touched it died. But political realities might be changing. Since 1980 the Alaska state budget has been funded almost entirely by oil revenue. Now with both declining oil prices and declining oil production, the state faces a large budget shortfall. 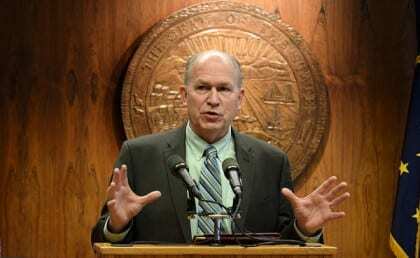 Lawmakers eventually agreed to close the deficit without tapping into the APF and PFD by cutting spending and taping into another state savings fund, but several lawmakers, including the state’s governor, Bill Walker, proposed tapping into APF earnings. The phrase “third rail of Alaskan politics” barely made the conversation. Well, since oil exploitation without any doubt increases global warming (anthropogenic climate change), PFD clearly means simply redistribution from the world population to the inhabitants of Alaska. Thus PFD obviously is neither an ethically nor financially feasible concept of ‘basic income’. Time to end that programme.